Less worthy than Fievel Goes West is this, the first of many, many sequels to The Land Before Time. It suffers many of the same problems - less sense of importance, less at stake and less sense of danger - but also has a much weaker central premise. That said, it establishes a fairly neat formula that would hold strong over many sequels and essentially does the same things that The Lion Guard would retread - rather more expertly - decades later. The plot follows the gang trying to be all grown up by foiling nasty egg thieves, for some reason given British accents by the actors behind Johnny Bravo and Pinky from Pinky and the Brain. They not only manage to foil these inept antagonists but end up hatching an egg. Not one of Ducky's siblings, as expected, but a Sharptooth! A baby tyrannosaurus. So begins a middle act about learning not to act with prejudice, even against a creature that will grow up to eat you without hesitation, and an inevitable third act about returning the baby to its vicious, voiceless parents. Almost none of the original cast sticks around, with only Cera of the main gang reprising her performance. I think this is before the tragic death of Judith Barsi, who played Ducky in the first movie, but her replacement does a decent job with the character's odd grammar. 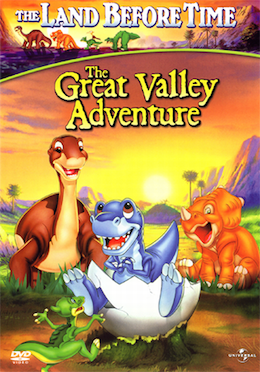 Littlefoot sounds older, but that works for a sequel and I didn't find fault with the main group. But the rest of the film is just too insubstantial. The egg thieves are bumbling idiots who pose little threat even to juvenile dinosaurs, and there's never any question of little Chomper’s fate, though I assume he'll be seen again in further sequels. In the original, poor Littlefoot is put through such a wide range of emotions it's very easy to empathise with him. In this sequel, there's just not enough to tug at the heart-strings or make us care about the current predicament. And that's what really gives the feel of a TV series as opposed to a movie. It's the sense of scale and significance. This movie would have been fine as three episodes of a TV show, but making a feature film demands rather more. At least Fievel Goes West tries to shake things up with a huge change of setting. This movie just continues from the first film with very little sense of peril or excitement, and the result, perhaps inevitably, is a film that just isn't very exciting.